Finding the right Birthday, Christmas, Anniversary or Mother’s Day gift can be overwhelming. Even more overwhelming if you are like my husband and have 3 of 4 within weeks of each other. I’m here to help you out with a list of my favorite gifts for the special girl in your life. Included in this gift guide you will find practical, thoughtful and unique ideas with a farm or rural twist. 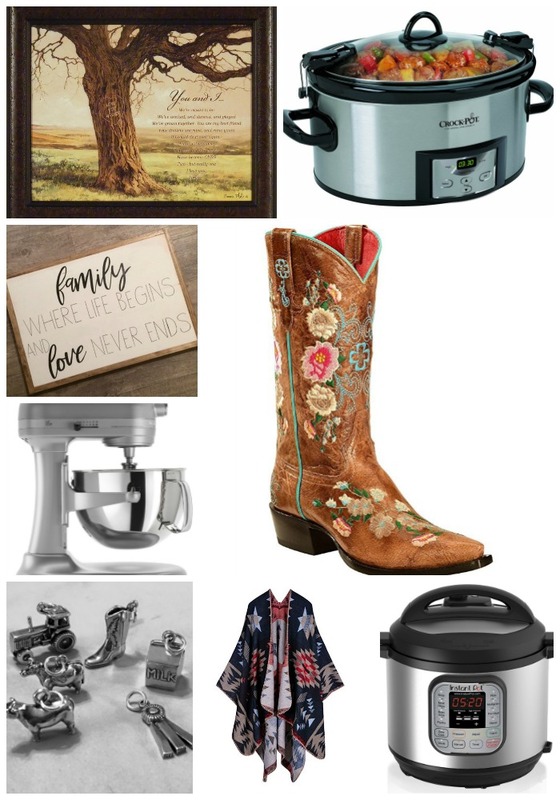 The kitchen is the heart of a country home so here are some of my favorite picks for the lady who’s in charge of feeding the crew or always cooking and baking. KitchenAid Mixer – These come in different sizes and colors. I have this one. Accessories for the mixer. Think of a mixer like your favorite Dewalt Power Tools same battery, different attachments. If the person you are shopping for already has a mixer one of these ideas would be a great addition! Flex Edge Beater. This Beater is way better then the one that comes with the mixer. Spiralizer Attachment with Peel, Core & Slice. My dad got me this for Christmas last year. Works great for applesauce! Extra Bowl – remember there are different sizes! I use multiple bowls quite often when making cakes, if cookie dough needs to chill around Christmas, etc. Instant Pot – An electric pressure cooker safer than traditional pressure cookers and cooks food in less time than say a crock pot. Crock Pot – Speaking of crock pots! I use mine a couple times a week and they are great to transport food to the field. Just make sure it has the locking feature. Gift Certificate for family pictures. There’s nothing more than a farmwife loves than her family, making family pictures a sweet gift idea. Custom Signs from the Milkmaid Co – These are really popular right now and perfect for a favorite saying or bible verse. My friend has some ideas on her Facebook age. Stock Show Boutique has some cute items including Tumblers and Makeup Bags. TIP – clothing and shoes can be tricky so before going to the store or shopping online look in the closet and check some tags to get an idea on brands and sizing. Get a gift receipt to be safe! Using favorite colors to aid in the decision process helps! Cape – capes are really popular right now and more forgiving on the sizes. Jackets – Carhartt, Columbia and The North Face are favorite brands of mine. Duluth Trading Company has great clothes for on and off the farm. You can’t go wrong with Jewelry! Pandora Bracelet– and then you can add charms for future holidays. Cow Art and More Jewelry – they have cute farm related charms including, Dairy cow, Beef Steer, Silo, Tractor, Barn, Boot, Cowbell and others. Purse – Brands and styles matter here so be sure to take a peek at what your loved one is currently using. 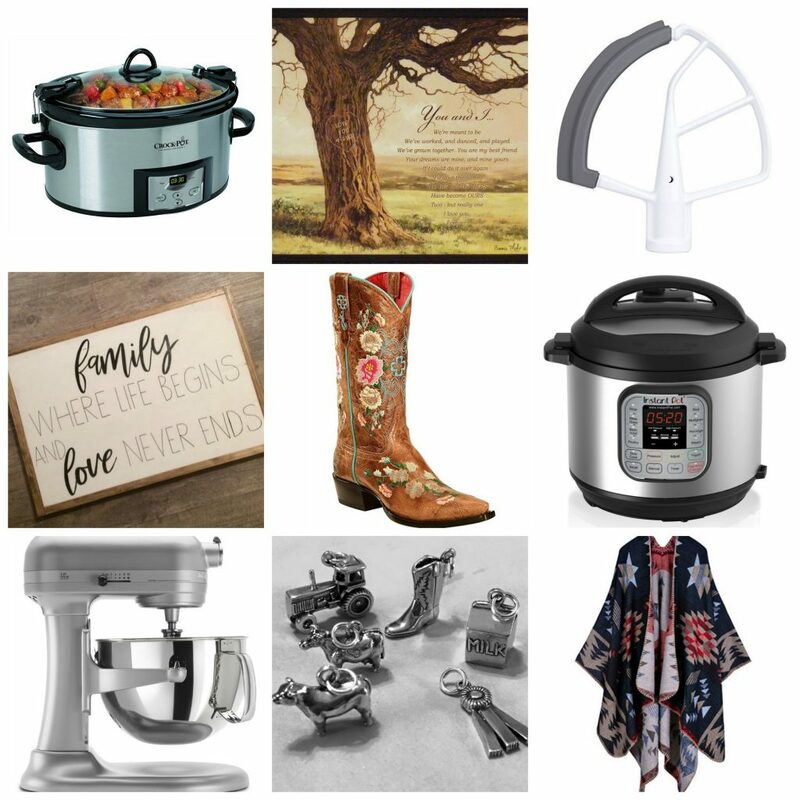 Check out these other Gift Guides from some of my friends! Want, Need, Wear and Read from The Farmwife Feeds. Gift Ideas For Farm Families from Plowing Through Life.